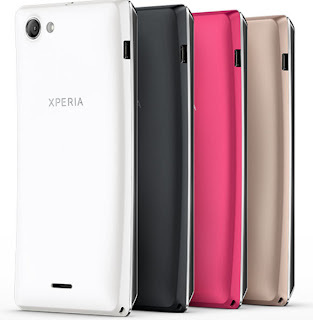 Sony Xperia J immediately caught our eye when we were browsing among many smartphones at a store. The phone feels nice to hold and has got a premium finish to it. We have lost count of the Xperia devices that came out recently, but this one was convincing somehow. 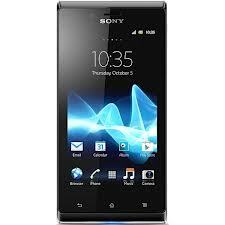 The phone has a simple rectangular design and Sony has worked it to look elegant with this device. The front is plain with three capacitive buttons for back, home and options menu which light up for a while when the phone comes out of sleep. The angular design carries the face that most new Xperia devices carry but it is a bit longer for the screen size and probably because there is too much space between the display and the capacitive buttons. The phone is comfortable to hold with its curved back panel and it feels solidly built in one’s hands. The design is somewhat like that of the arc and arc s, only fatter. The back panel has a nice rubbery finish to it and it would save the device from minor scratches. Though if treated badly, these rubbery back panels end up looking hideous but that would take ages literally. The power and volume keys are present on the right spine of the phone and their placement is okay but the feel you get from power button is not good. It is the one key used most on a device and they have made it so small and rubbery. The small USB port is placed on the left spine and the top has got just the 3.5 mm audio jack. On the back sits the 5mp camera on the left of back panel along with the LED flash. The loudspeaker sits near the bottom of the device. The phone has a 4 inch FWVGA(480*854) TFT display with 16M colors. The display is crisp, has got good contrast and the images are vibrant until u try to share the display with a friend. The viewing angles are not good at all. The colors tend to fade as you vary the angles. There is no light sensor on top of the device and this means that there is nothing like automatic brightness. You would have to vary the brightness yourself whenever you step out in the sun, come back indoors or try to read a text in the middle of the night. The phone was supplied with android 4.0.4 Ice Cream Sandwich but now they have rolled out the update to Jelly bean 4.1.2 for many devices. Both the software versions for the device are heavily skinned with the custom interface seen on most Sony devices. The home is usual 5 screen interface with no option to add or remove any screens. There are two shortcuts on each side of launcher key which can be customized. Most of the launcher interface remains just like it used to be in gingerbread. The new jelly bean update adds few cool features like the shortcuts in notification drawer. There were a few minor glitches in ICS on Sony but the JB feels butter smooth. 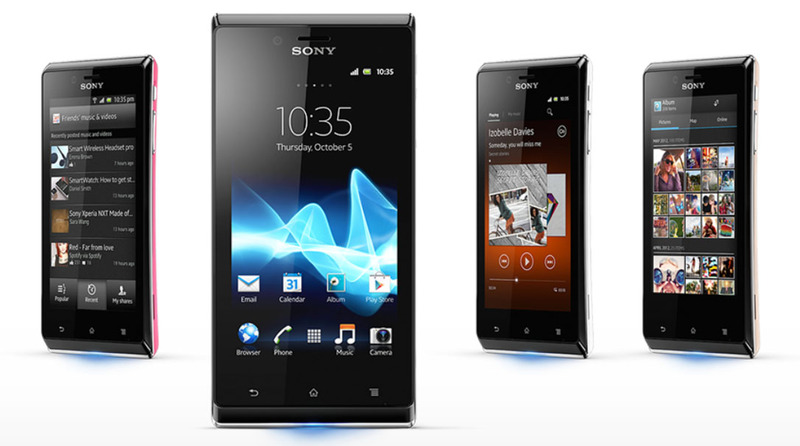 There are many Sony made widgets too to customize your home screen. The interface is nice overall but we are kind of bored of the usual menu layout. Sony really needs to change the way home screen and menus are, to give their devices a fresh feel. The device runs on 1GHz ARM Cortex-A5 processor along with Qualcomm MSM7227A chipset packed with 512MB of RAM and Adreno 200 GPU and this is almost the basic hardware for any android device nowadays. After a while of usage, the phone starts to lag a bit as processes start to stack up. This is inevitable with a 1 GHz single core device with just 512 MB RAM. You need to keep the phone really clear of any useless apps if you want it to run smooth. Gaming is not its forte but still it can run many games on the play store and would do your casual gaming jobs if u are patient enough and clear the RAM extensively before running the game. For web browsing, the stock android browser takes a while to process the page when you zoom in or out. It also lags a bit when you tap on a text entry box or try to select a saved input in forms. If you use the browser for a while to open heavy pages, chances exist that it might crash. So I would suggest you use it for light browsing and also install a web browser like opera mini which is light on resources. The performance of the device wasn't very satisfactory for us but for someone who needs a decent device, just to serve the basic usage, the phone can cope up well. The jelly bean update also made the experience a bit smoother on the device. The camera on the device is a 5mpx shooter which performs well. At this price you don’t expect the camera to really blow off your mind. The photos have got enough detail when shot in proper light. When the light is too much or too little, it takes a while to focus. The photos taken in dark are grainy as on most mobile cameras and the LED flash makes people look like smiling white ghosts. The video recording is VGA in mp4 format with aac audio. The video recording quality is decent and there are no lags or freezes at all. The battery is 1750 mAh removable unit and it performs pretty well in the device. I have seen people complaining about the low battery life of Sony devices but this one seems to make an exception. The device battery lasted till the evening of second day and this is one of the very few devices whose battery ever made it to the second day in my usage. Sure the battery level will drop fast if you push that little CPU to its limits but still it is better than most devices that compare to it. The dialer on the phone is designed pretty well and it integrates the call log as well. When you start dialing numbers, it searches among numbers as well as names like in most phones. There is proximity sensor to disable the touchscreen as on most devices. The calls were not exceptionally clear but there is not much to complaint about. The reception was good and switching networks from 3G to 2G doesn’t take long. This is not a phone without any glitches but if you want a decent looking device that will serve you well with basic smartphone features then this is a nice pick. The phone looks premium for its price and the display, music player, interface and battery life are good. It is available for around 14K and there are some alternatives you can choose from if you can compromise performance for looks and brand name. The Author of this post is Julia. She wrote several tech posts for 91mobiles.com. Also have a detail look on Sony Xperia J in India. Her passion for upgrading her knowledge puts her to research on topics relevant to her industry. Besides, she also likes to share her findings by writing about them in her free time..